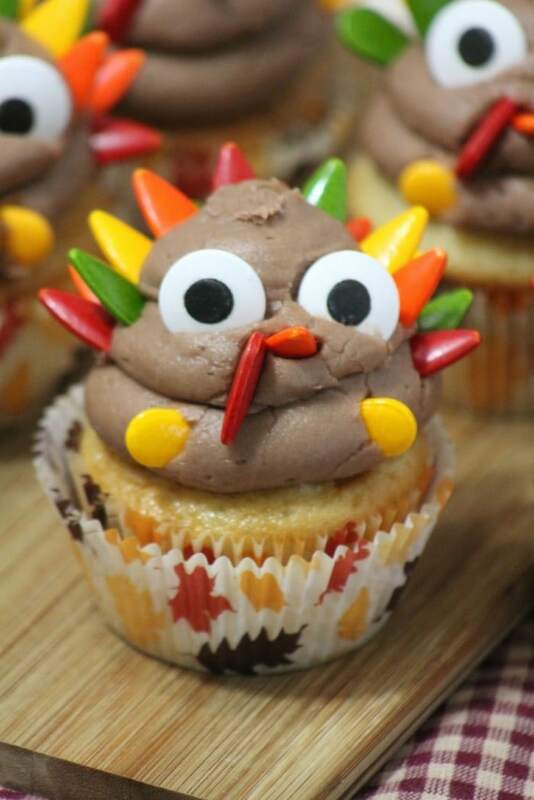 I just love this Thanksgiving Turkey Cupcakes Recipe! 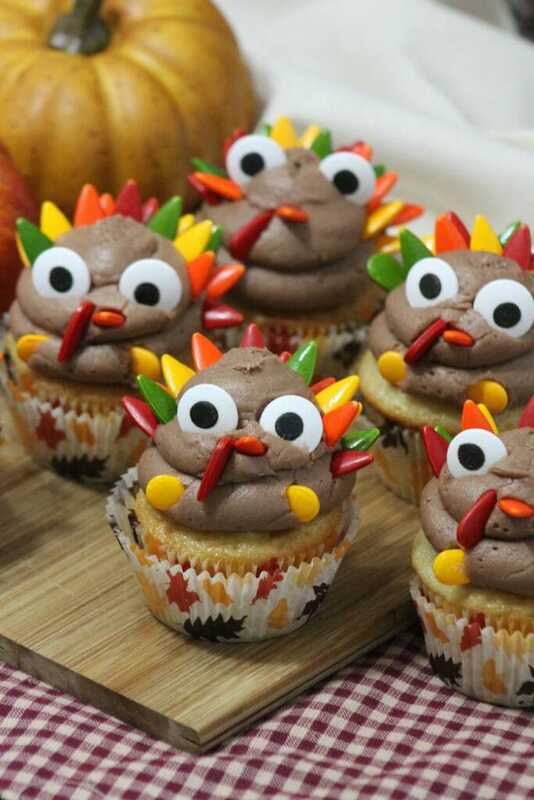 What a great idea for Thanksgiving! 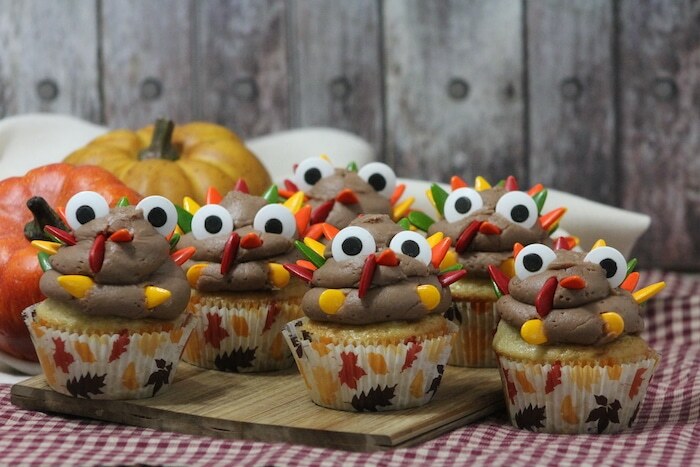 If you are having a party at home or if it’s your turn to bring in this dessert for the kids at school, consider these turkey cupcakes. The frosting configuration isn’t as hard as you think! In fact, it’s actually quite simple. Take a look to see how they are done below. Stir flour, baking powder, baking soda and salt in a medium bowl. Sit aside. In an electric stand mixer whip the butter and sugar until pale and fluffy in the mixing bowl. Add in an egg, then the egg whites one at a time. Add the vanilla with the second egg white. Mix 1/3 of the flour mixture alternating with 1/2 of the buttermilk. Mix after each addition only until just combined. With all ingredients blended, spoon the batter into the paper lined cupcake pan until each tin is 3/4’s filled. Allow cupcakes to cool in cupcake pan for 10 minutes. Remove cupcakes from pan and place each on a wire rack until cooled. Beat the softened butter on its own until smooth. Add cocoa and powder sugar alternately with heavy cream into the creamed butter until it becomes a smooth and thick texture. Scoop frosting into a large pastry bag with a frosting tip. Twist the open end of the pastry bag to push frosting to the tip. Following the outline for the layout of the decorations on the cupcake. Begin to create the feathers. There is no color order that is right or wrong. Be creative. I started with the back row first and then row two and finishing with the row closest to the eyes. With all ingredients blended, spoon the batter into the paper lined cupcake pan until each tin is 3/4's filled.